Billy Joel, We Didn’t Start the Fire. 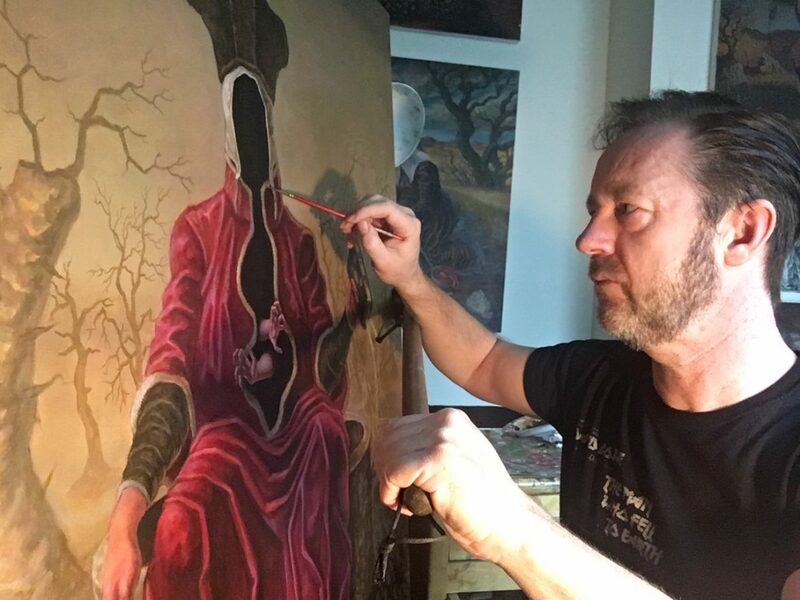 The working title for this one might end up being “The Artifice of Fraud”,”Cognitive Dissidence”, “Origins of a Black Hole” or something entirely different. Given these time’s it was created in, there shouldn’t be much of a symbolic leap over what, or rather “whom” it’s about. That it’s the penultimate piece to a series about ill omens and man’s predisposition toward self annihilation, may have fresh and foreboding significance, given the US and the former Soviet Unions recent withdrawal from the nuclear arms treaty. If we survive the years ahead, at the very least the best historical legacy we could look forward to, may be the flourishing of art that reflects the period we live in. For instance, the atrocities of Spain’s bloody war produced Goya’s Distasters of War, the horrors of Otto Dix’s nightmarish hellscapes, sprung from the decay of first WW trenches, Philip Guston’s eviscerating scrawls showcased the Nixon years, and Peter Howson’s sprawling canvases rose from the stark degradation and inhumanity of Bosnia’s war. If there is one thing safe to assume, it’s that we live in fertile times for works of such scope. 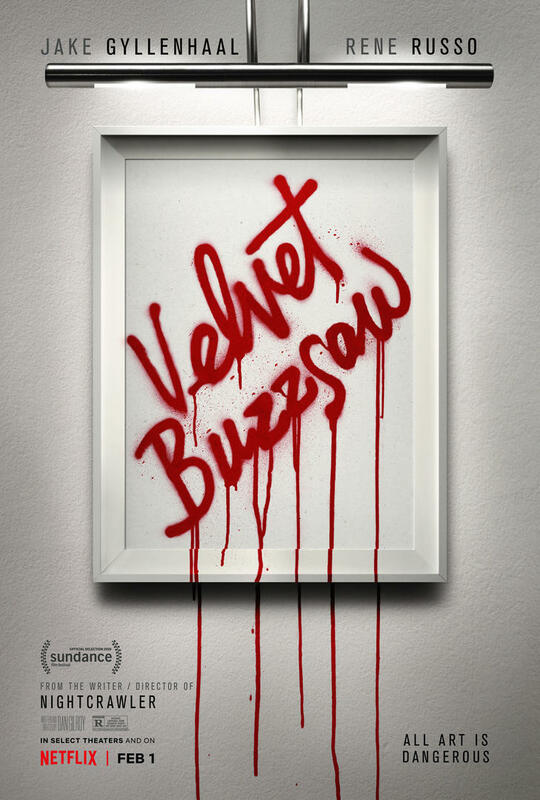 Having just viewed Velvet Buzzsaw on Netflix, I’m heartened by the fact that for all the droll and ugly depiction of artifice and hollow pretension in the Contemporary Art World, at least Hollywood seems in on the secret that Dark figurative painting, is the most authentic art of substance. Albeit if the artist was mad, unknown and dead. One more to go before showtime, long nights of back breaking daubing and blind panic before showtime. While you wait to see the new stuff, here’s some old stuff-a blast from the past when I was unknown, mad at the world and may as well have been dead. Encompassing the decade 1987 to 1997, for what were my wilderness years, I’ve uploaded a gallery of curio’s for those who might be curious . 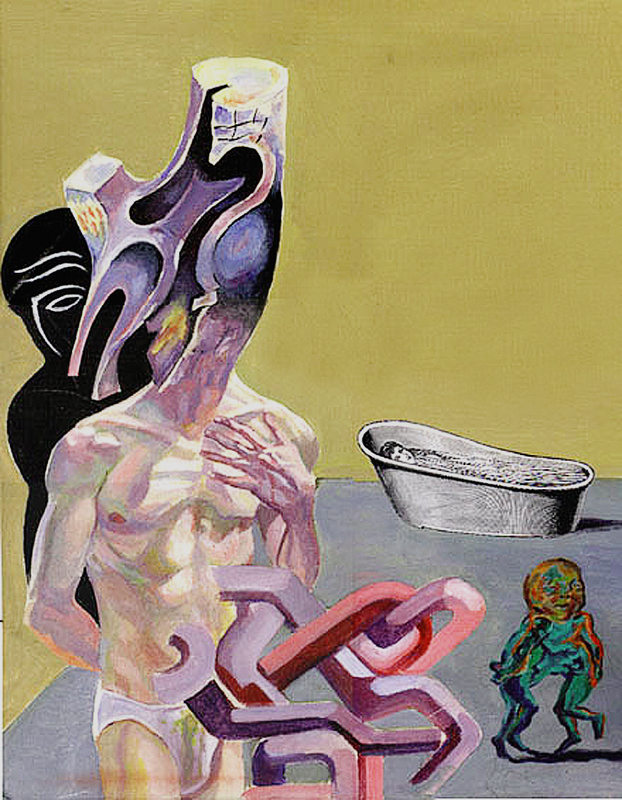 Whilst I wish I could include the long since lost Dalinian neurotic etchings of ’84, or the following summer painting Eric Fischl style nudes, what remains are I think, my first embryonic stumbling’s through the same spiritual dark matter that has consumed my work for my entire artistic life.